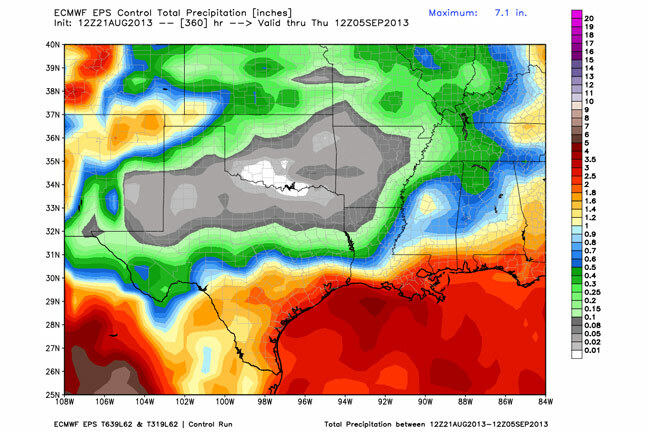 Long range precipitation forecasts for southwestern Oklahoma don’t offer any good news, according to Associate State Climatologist Gary McManus. The probability of receiving any appreciable precipitation through September 5 is extremely low. Southwest Oklahoma is dealing with a water emergency as the Tom Steed Reservoir drops perilously low, not to mention the pathetic shape of Lake Altus Lugert. The Climate Prediction Center forecasts above normal temperatures and below normal precipitation from August 30 through September 5. McManus says that those long range forecasts can be notoriously inaccurate and even if they prove true, most areas of the state have had sufficient precipitation to withstand a return to summer conditions for a couple of weeks. He also says that most lakes in the state outside of the south and west are currently full which is ahead of where they would normally be at this time of year.